Gong Hey Fat Choy - Gong Xi Fa Cai and Happy Lunar New Year! Celebrate the start of the lunar new year on Tuesday 5 February 2019 and Welcome 2019 Year of the Pig. We can deliver a beautiful Chinese New Year gift, anywhere in Auckland for you. 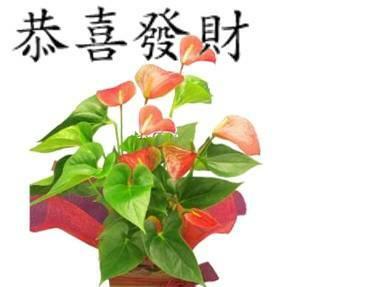 From colourful red and yellow flowers to wish you good fortune and happiness, to bright red anthurium plants in gold gift wrapping to wish them wealth, long-lasting pink orchid plants and beautiful bright flower bouquets and fruits. Lunar New Year flower delivery in all Auckland Suburbs- Howick, Botany Downs, New Lynn, Takapuna, North Shore, Hillsborough, West Auckland, East Tamaki and Auckland wide. Best Blooms is proud to be an award-winning Local Auckland Florist. TOP SHOP Winner. Our service is 100% Guaranteed - You can Trust us to deliver. Celebrate with your family and the ones you love for this wonderful holiday period. We wish you a Happy Lunar New Year - Gong xi fa cai.